2 How can I make a difference? Watch the film and think about how you can make a difference Using the film: The film can be played at the beginning of the session to get people thinking. 3 Why does it matter? 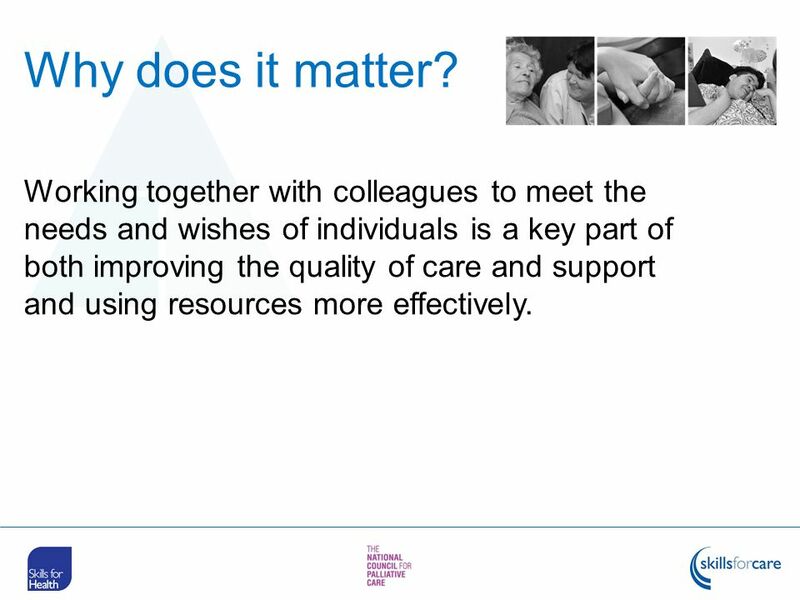 Working together with colleagues to meet the needs and wishes of individuals is a key part of both improving the quality of care and support and using resources more effectively. Working together matters at all times, we are talking about end of life but much of what we are talking about applies whatever the situation. 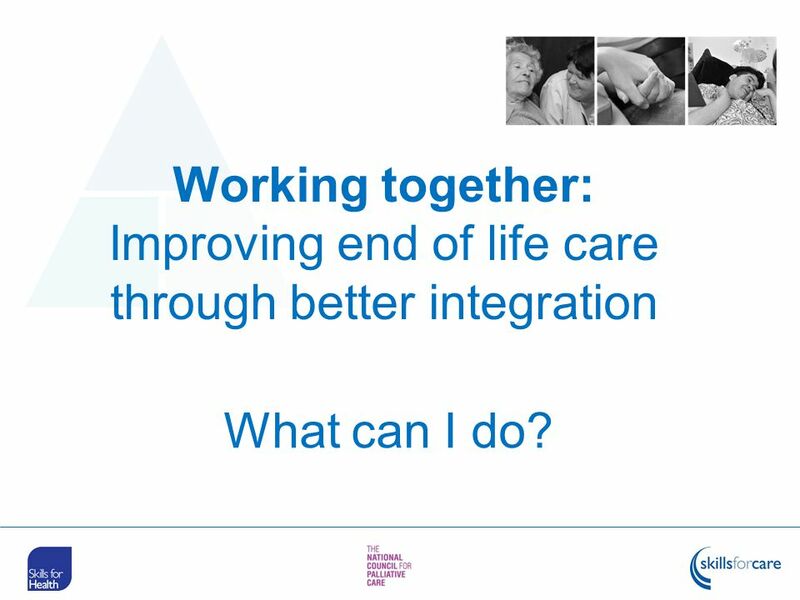 End of life care is about many things, and we will touch on some today but this session is focussing on how we can work better together to improve the care and support given to people at the end of their lives. 4 What does it mean? Sharing information and streamlining assessments. 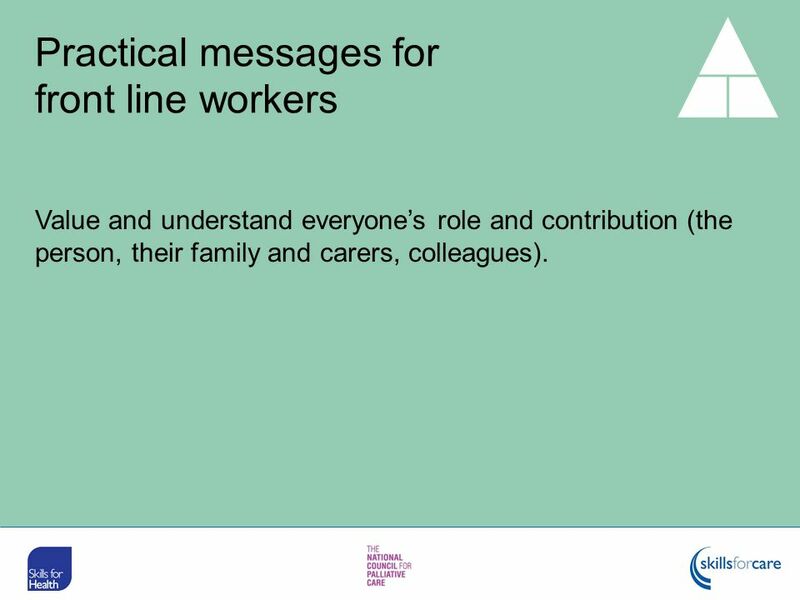 This is what people working at the front line, and carers, said about what really mattered in working together, and how individual workers could make important differences to the experiences of people at the end of their lives, their families, and carers ACTIVITIES Activity two “Working Together” can be done before looking at the messages slides What can I do? 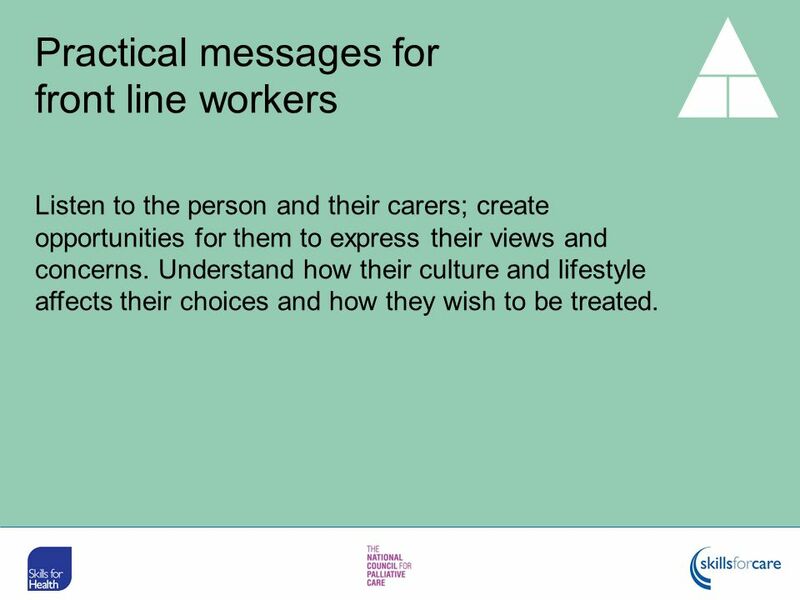 Listen to the person and their carers; create opportunities for them to express their views and concerns. Understand how their culture and lifestyle affects their choices and how they wish to be treated. Be sensitive to the situation, explain things clearly and fully, taking account of the emotional impact of the person’s situation. Find out what the person already knows, and establish what else they want to know. Check that the person has understood what you say. Good communication means listening for cues and making opportunities for people to talk to you about how they feel if they wish to. People’s priorities will be shaped by their lives: their culture, their relationships, their religion, lifestyle, occupation and other things. 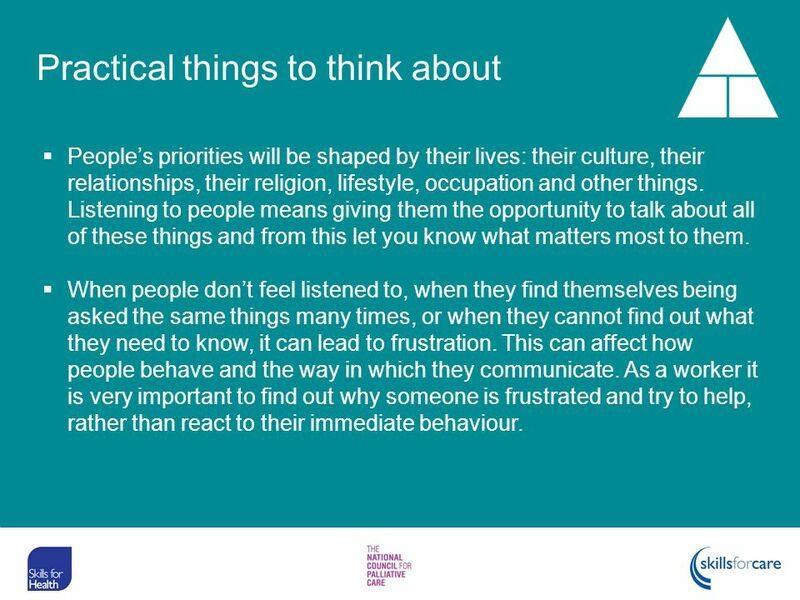 Listening to people means giving them the opportunity to talk about all of these things and from this let you know what matters most to them. When people don’t feel listened to, when they find themselves being asked the same things many times, or when they cannot find out what they need to know, it can lead to frustration. This can affect how people behave and the way in which they communicate. As a worker it is very important to find out why someone is frustrated and try to help, rather than react to their immediate behaviour. Care plans are developed around the stated priorities of the person, kept up to date and shared across the care and support team. 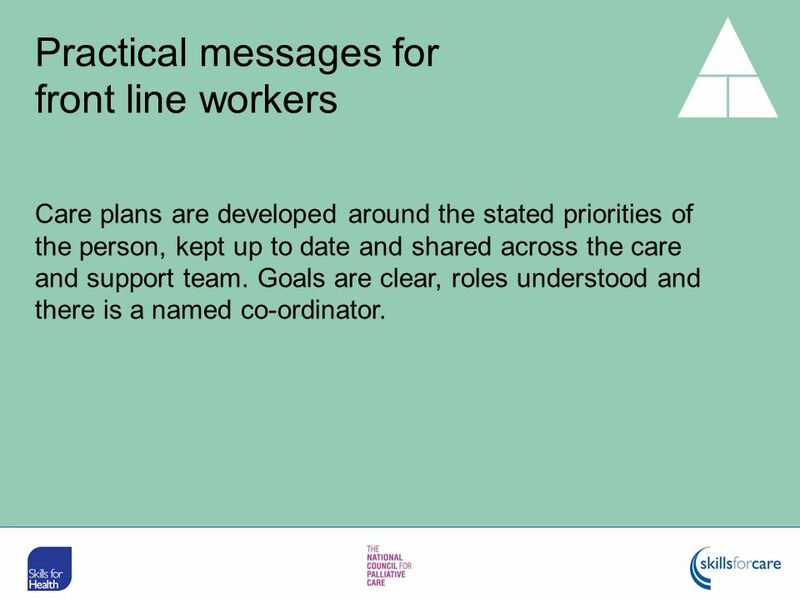 Goals are clear, roles understood and there is a named co-ordinator. The experiences and views of people receiving care and support, and their carers, are paramount. By listening to what they say you will find out what they want and you will know if and when that changes. 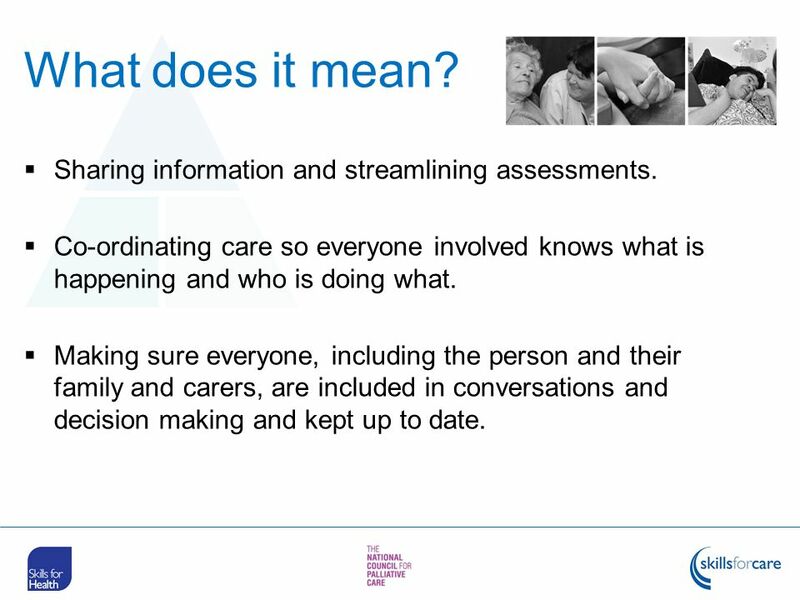 The care plan is very often the reference point for everyone in the care and support team. Make sure it is up to date by sharing new information you have, and contributing to the development of the plan. 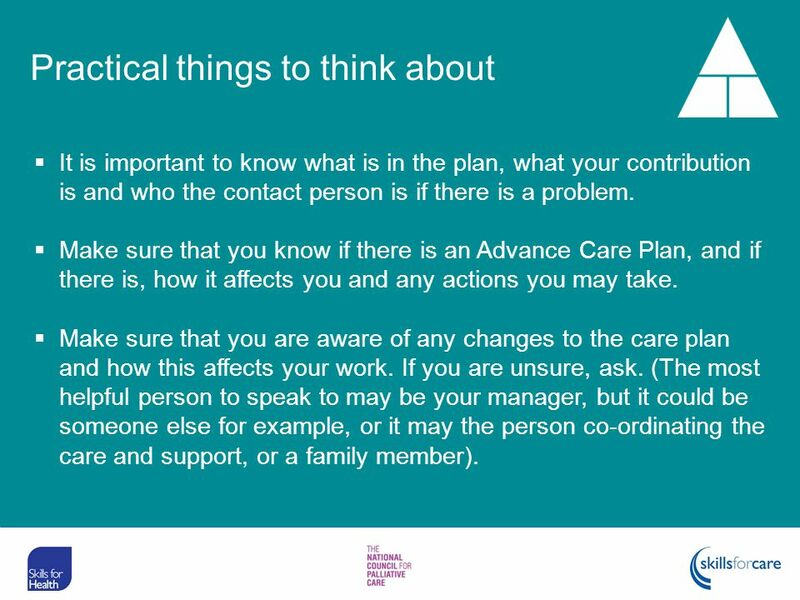 A good care plan clearly describes how the person and their carers will be supported, including each person’s role. The plan will be decided upon by the person, their carers and relevant members of their care team. The plan should reflect any changes, including information about funding and care providers. 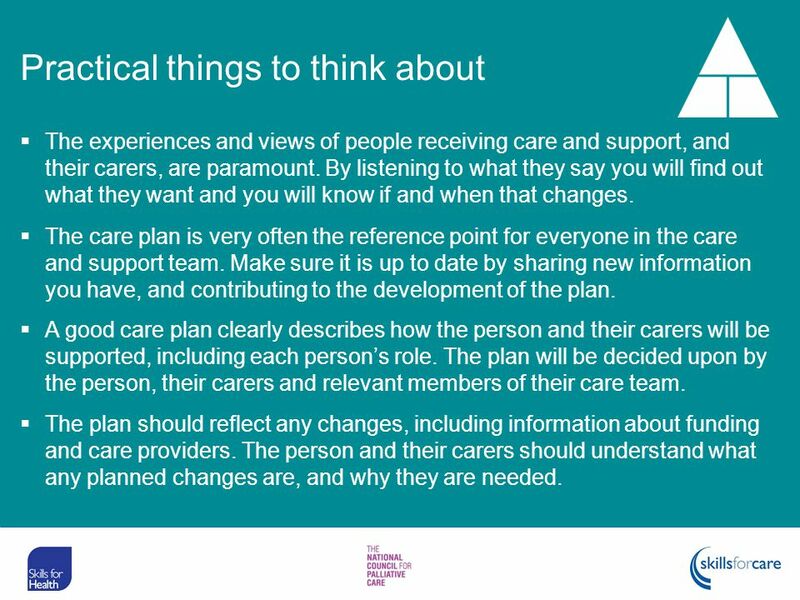 The person and their carers should understand what any planned changes are, and why they are needed. An Advance Care Plan is different to other care plans. It is written so that if a time comes when the individual is not able to decide about their care or treatment, it can be used to guide decisions. For example, it may say whether a person wishes to be taken to hospital if they become unconscious. It is important to know what is in the plan, what your contribution is and who the contact person is if there is a problem. Make sure that you know if there is an Advance Care Plan, and if there is, how it affects you and any actions you may take. Make sure that you are aware of any changes to the care plan and how this affects your work. If you are unsure, ask. 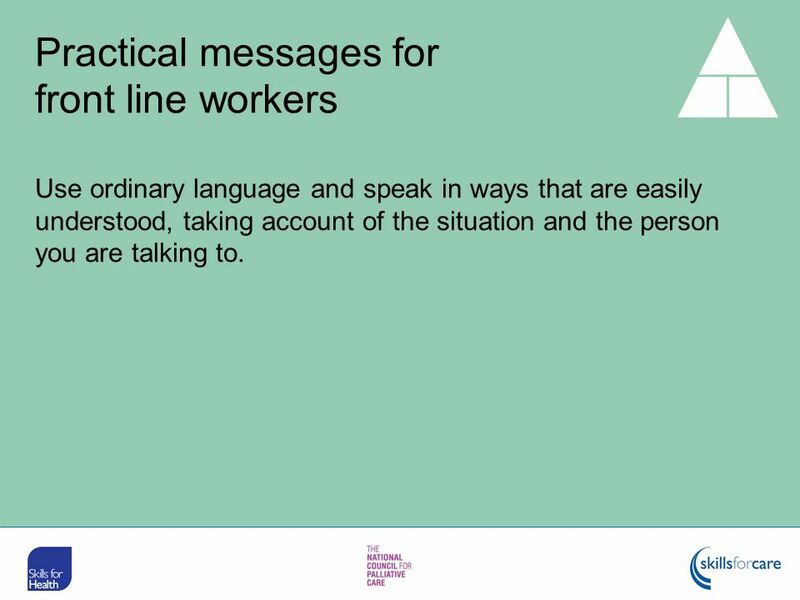 (The most helpful person to speak to may be your manager, but it could be someone else for example, or it may the person co-ordinating the care and support, or a family member). 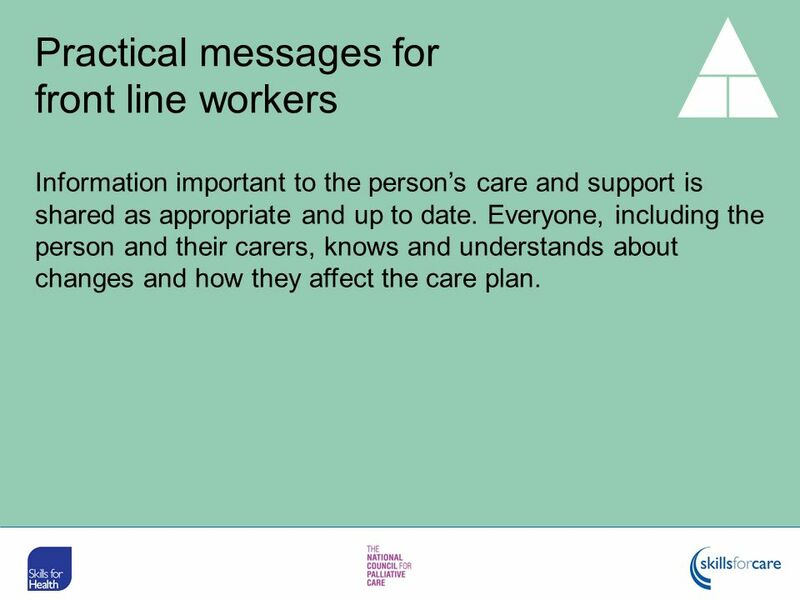 Information important to the person’s care and support is shared as appropriate and up to date. Everyone, including the person and their carers, knows and understands about changes and how they affect the care plan. 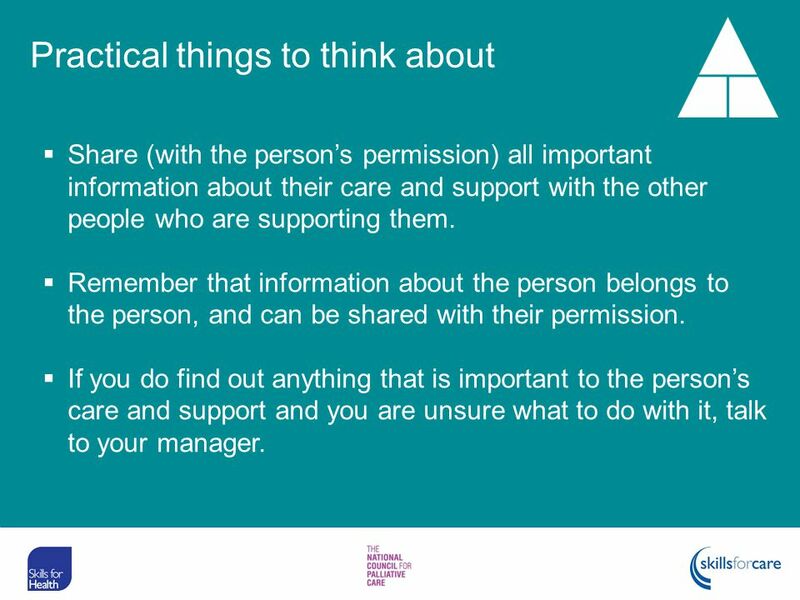 Share (with the person’s permission) all important information about their care and support with the other people who are supporting them. Remember that information about the person belongs to the person, and can be shared with their permission. 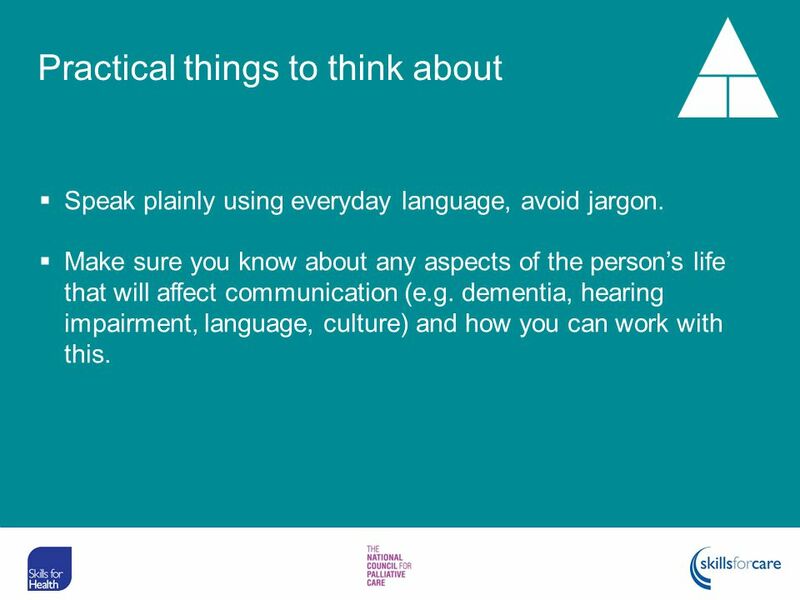 If you do find out anything that is important to the person’s care and support and you are unsure what to do with it, talk to your manager. Find out as much information as you can by reading care plans or assessments, and asking colleagues. Repeatedly being asked the same things is both frustrating and a waste of time for service users and carers. 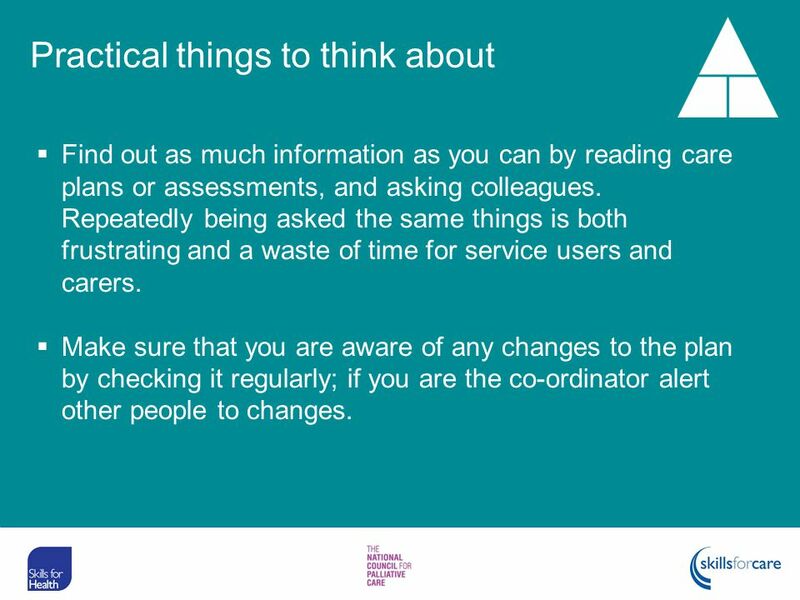 Make sure that you are aware of any changes to the plan by checking it regularly; if you are the co-ordinator alert other people to changes. Value and understand everyone’s role and contribution (the person, their family and carers, colleagues). 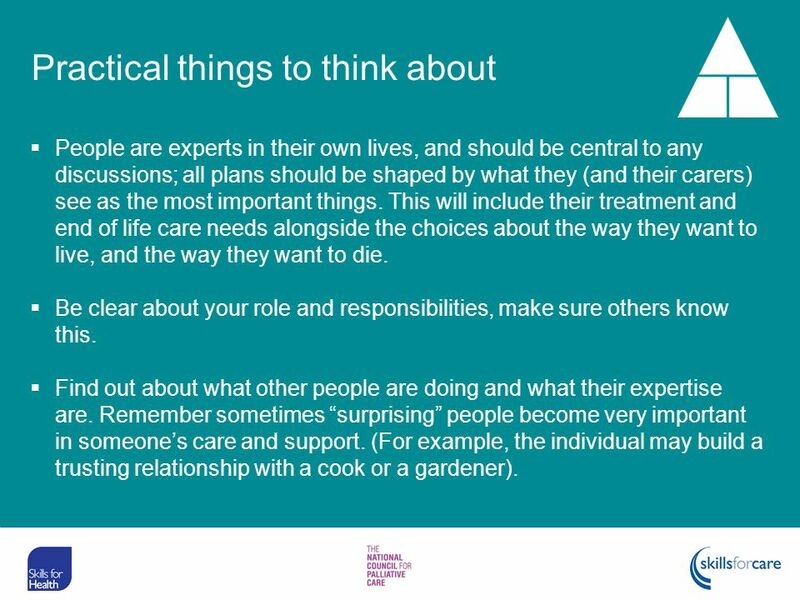 People are experts in their own lives, and should be central to any discussions; all plans should be shaped by what they (and their carers) see as the most important things. This will include their treatment and end of life care needs alongside the choices about the way they want to live, and the way they want to die. Be clear about your role and responsibilities, make sure others know this. Find out about what other people are doing and what their expertise are. Remember sometimes “surprising” people become very important in someone’s care and support. (For example, the individual may build a trusting relationship with a cook or a gardener). 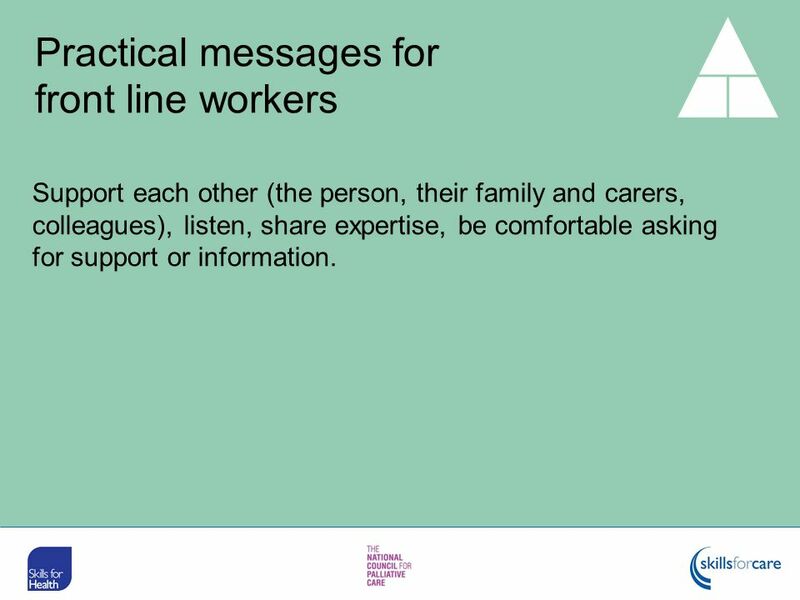 Support each other (the person, their family and carers, colleagues), listen, share expertise, be comfortable asking for support or information. 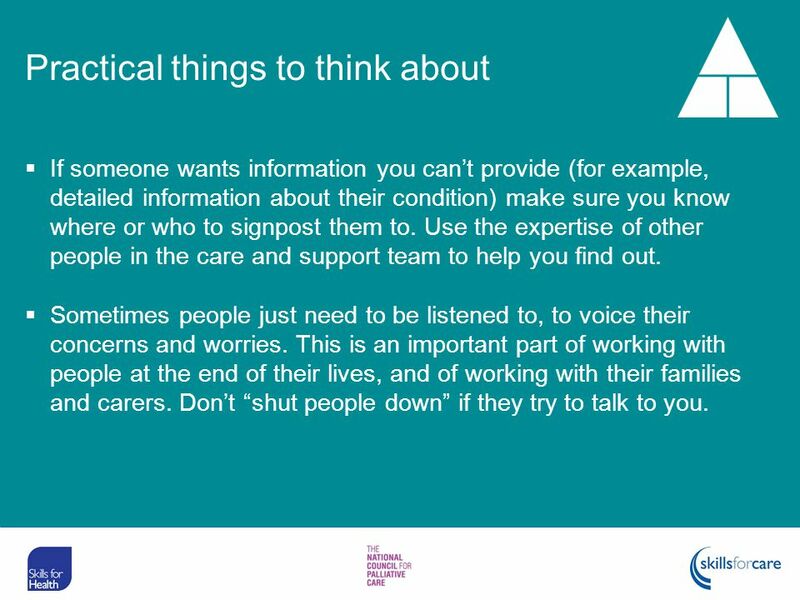 If someone wants information you can’t provide (for example, detailed information about their condition) make sure you know where or who to signpost them to. Use the expertise of other people in the care and support team to help you find out. Sometimes people just need to be listened to, to voice their concerns and worries. 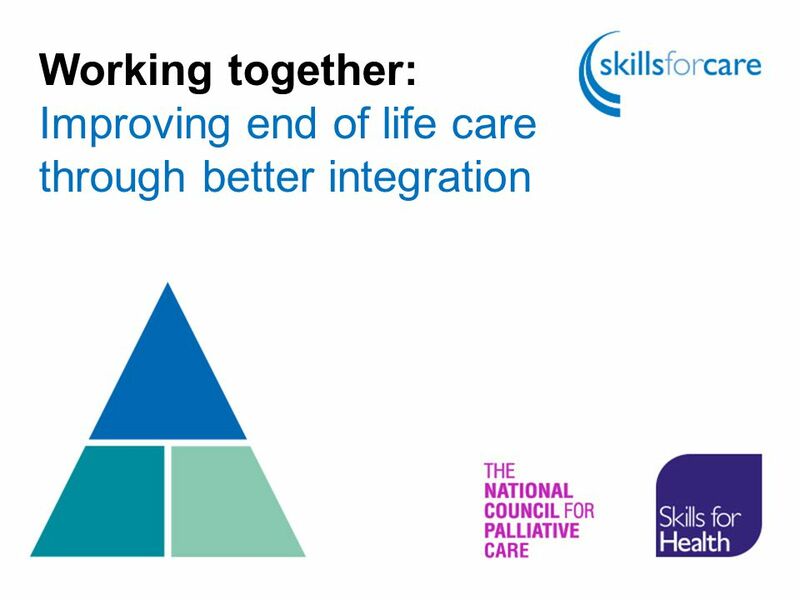 This is an important part of working with people at the end of their lives, and of working with their families and carers. Don’t “shut people down” if they try to talk to you. If you find yourself out of your depth, pass your concerns on to your manager. Working with people who are dying can be and emotional experience for workers too. Don’t feel uncomfortable about asking for support. Some employers can offer more formal support if that is needed, or you may want to talk to members of your team. 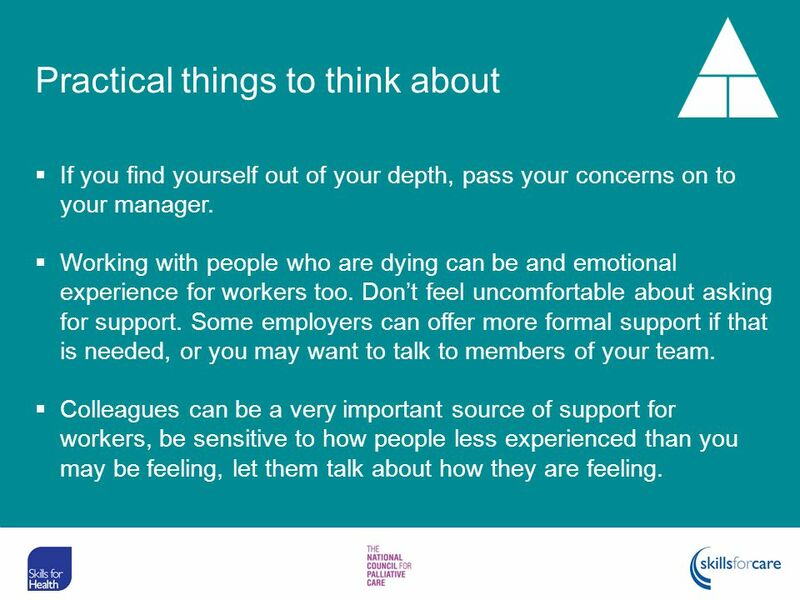 Colleagues can be a very important source of support for workers, be sensitive to how people less experienced than you may be feeling, let them talk about how they are feeling. Use ordinary language and speak in ways that are easily understood, taking account of the situation and the person you are talking to. 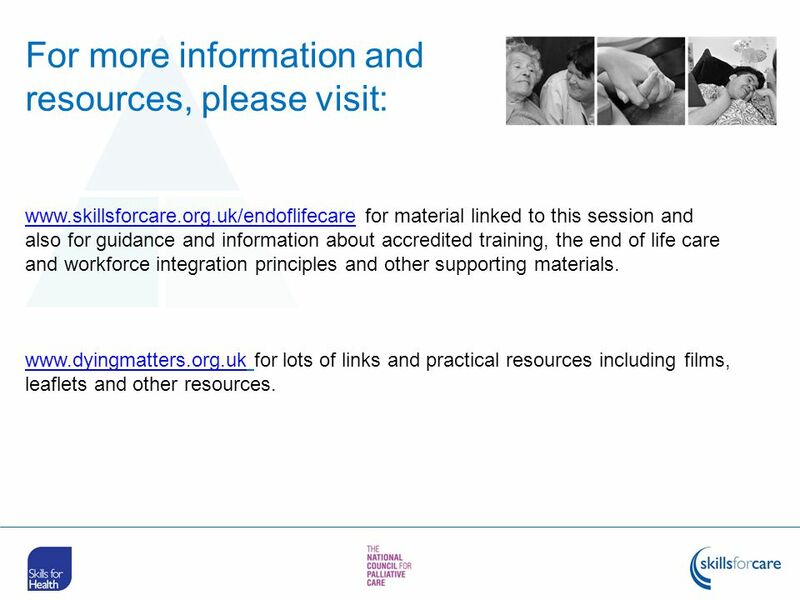 for material linked to this session and also for guidance and information about accredited training, the end of life care and workforce integration principles and other supporting materials. for lots of links and practical resources including films, leaflets and other resources. 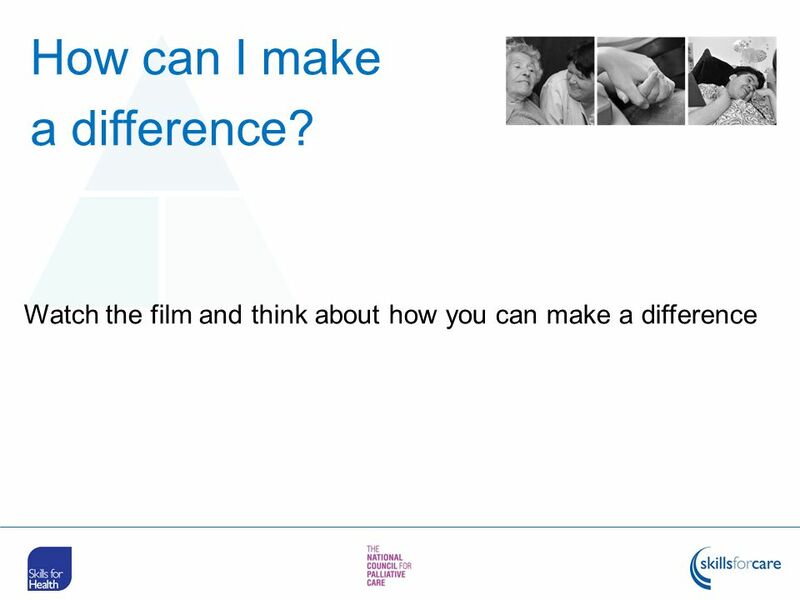 Download ppt "How can I make a difference?" LESSON 2: COLLABORATION FOR IEP DEVELOPMENT Module 2: Creating Quality IEPs for Students with Autism Spectrum Disorders. Session 5-8. Objectives for the session To revisit general themes and considerations when delivering the intervention. To consider sessions 5-8 and familiarise.  Communication Barriers. Learning Goals  5. I will be able to explain obstacles/barriers to effective communication  6. I will be able to suggest ways.